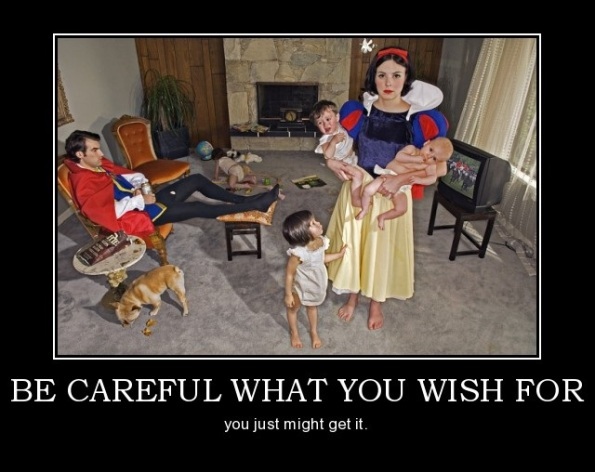 I’m almost certain that you’ve heard the statement “Be careful what you wish for.” I’m also almost certain that only a third of your mind believes it to be true, because this statement is known as a cliche…. an overused statement that may or may not be accurate. This morning is much different than my recent past mornings. I’m slowly sipping on a home brewed coffee, digging into time with Jesus, struggling to tie back my unruly, bed head inflicted short hair (which is really the worst part of short hair) and taking a moment to enjoy not needing to be somewhere until this afternoon. It’s a nice intermission, which I’ll explain more about in a moment. This morning, I happened upon the story of James and John asking Jesus for something that they didn’t fully understand. Here’s the thing. Jesus is the most patient GodHuman. Yes He is God… but dude, He was also a man… and as a human being, I would have wanted to throw something at these guys because of how dumb and selfish their request was. But instead of being like me, I really believe that Jesus gives them the answer to their request. Instead of saying yes, Jesus gives them the opportunity to get to a place where that would be a consideration in the mind of the Father. You see, James and John wanted the instant fix… the get rich quick model… the no work all play method. They wanted the gold medal for sort of participating. I imagine Jesus smiling incredibly sorrowfully and sympathetically at this point… knowing where their heart is, knowing where their future is going, and knowing what it was they were actually asking. So He affirms them, telling them that they will follow in His footsteps, but then breaking the bad news that those spots are not His to give up. Jesus finishes this interaction by diffusing the 10 other disciples that were absolutely pissed off at James and John. He reminds them that a life of service is what makes your life important or valuable. Being a servant to others takes humility, dedication, patience, love and sacrifice… and it is the call to a life that Jesus lived. I’d guess that James and John probably wouldn’t have asked for those spots if they had actually known the cost of being considered for them… at least not at the point in their lives. But ignorance is total bliss. In high school, I remember praying for patience… in waiting for things, in dealing with little sisters, in trying not to fight with my mom. But my prayer wasn’t asking for actual patience… it was asking for a magic, cure all insta-fix of transformation so that my life could be easier and more enjoyable. Instead, I was unknowingly asking for specific sanctification. Instead of finding myself instantaneously able to be patient, I was put in circumstances where I was given the opportunity to be patient. It was like patience weight training and I was a nerd who had very little athletic ability. I didn’t realize what I was asking for, but I’m glad that the answer was practical and not magical. I’m glad I had work through my issues to become more patient because it builds solid character. I would submit that this is how God works in every area of discipline… do you need to love more? Here’s a really obnoxious person that is incredibly hard to like, let alone love… do you need to be more self controlled? Here’s an opportunity for you to choose God over what you want to do. This is life in submission… life dedicated to the Father… life that is centered on Him. So back to why I’m sipping on a delightful caramel french roast, writing a blog at 8:50am, rocking the pillowface/ozzy osbourne look. Monday afternoon, I gave my two week notice at a job that has taught me how to be content in the midst of negativity. Brady (my awesome husband) and I sat on the bedroom floor Friday night as I cried about the frustrations, the negativity and lack of integrity that I was being exposed to at this place I had only recently began working for. Together, we chose to step out in faith, believing that Lord was in this decision and trusting that He would provide another opportunity. God is good, and has met us with complete peace in this risky, illogical move. Tuesday morning, I was approached by my boss and told that he didn’t see the point in me being there for two more weeks, and that I could just leave that afternoon. A blessing? Even more so. The funny thing is that in my day to day walk, I’ve been learning how to be content in the situations I’m not thrilled about… money being tight, a job that isn’t going anywhere, student loans, driving a Kia, not being the adult that I imagined I would be at a younger age. Asking to learn what contentment looks like was quite similar to asking for patience… the opportunities showed up instead of the virtue. Now, some of you may be shaking your head, assuming that quitting is not pursuing contentment… and that’s fair, because I was concerned about that too. But here’s where I was wrong: contentment is not a pursuit of misery and being happy in that misery, it is being faithful to find joy in where God has called you. I can certainly say that I was being called to leave the security of a full time job at a place that was not in the business of pursuing goodness. Contentment for me now is being joyful while I’m uncomfortable, trusting God for opportunities, and remaining surrendered to Him. And that is that. No more, no less. So friends, be careful what you ask for… because you might actually be put in a situation that causes you to grow up into the likeness of Christ more than you did yesterday.